Attend a Classic Car Auction this Summer! June is one of the best months of the year if you’re a classic car enthusiast, and not just because a good part of the world is finally thawed enough to open the garage. The good weather brings back local drive nights, cross-country tours, car shows and car auctions. The classic car auction remains one of the most popular ways to get a hold of one’s dream car and can also prove to be a fun way to spend the day or weekend. It’s not unusual for a car show to be bundled up with a classic car auction. Cars that will be for sale later in the day or week are lined up for spectators to view beforehand. It’s all part of creating not just a sales event, but a fun activity for any car enthusiast to take part in. This presents a chance for bidders to see the cars they’re interested in up close, ask questions of the sellers or auction staff and maybe even get a test drive. As the season matures, you’ll probably notice that some of the cars listed on Cars On Line aren’t being sold directly, but are cars heading to auction somewhere in the world. There are three main ways to get familiar with a car you intend to bid on. Cars going up for auction are given a “lot number” and those lot numbers can usually be referenced in the auction program and on the display floor. For particularly well orchestrated auctions, those cars are listed on websites like Cars On Line beforehand, so that potential bidders can know exactly what they’re bidding on later. People having fun and talking cars creates an atmosphere that helps to generate sales, excitement that can be enhanced once the auctioneer starts rattling off the bids in that classic “auctioneer cry” that’s also called “bid calling.” Auction attendees see the car, talk for a few moments about what it might be worth and in only a few short minutes, the car is sold. It’s quite a rush, even when you’re not bidding. The most common way to bid is from the auction floor. Sometimes, a potential bidder will have to register for a bidding number that will allow auction staff to easily see who made the winning bid. That’s the most iconic method of bidding, but today’s auctions have gotten a little more advanced. Many auctions will now accept bids by phone, or even online. In these cases, a bidder will register a particular amount they’re willing to pay for a car. The auctioneer will start the bidding at a predetermined amount, and other auction staff will bid on behalf of those who aren’t on site, up to the amount they were authorized. It’s called proxy bidding and is one of the major ways classic car auctions are changing. More and more people are taking advantage of proxy bidding to save money and time. Watch this video of a 1963 Shelby Cobra sold at the Spring Mecum Auction in Indianapolis, Indiana. For more about the Mecum Auction, see the companion blog post on ClassiCar News here! Auctions have a reputation for items selling for much more and much less than they’re worth, so some car owners are leery of chancing the value of their car to the whim of the attending crowd. They’ll set a “reserve price” to help ensure they get what they want for the car. 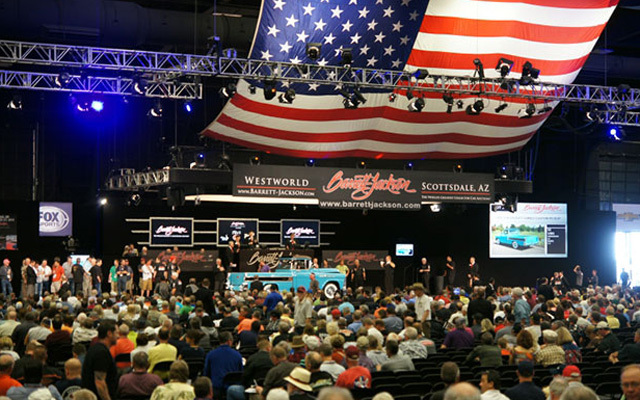 Though the auctioneer will start the bidding at less than the reserve price, they aren’t authorized to actually sell the car unless bidding meets or exceeds the reserve. If the “winning” bidder is still under the reserve, he’s under no obligation to part with his cash unless the owner of the car waives the reserve. Auctioneers can sometimes generate excitement for a car and drive up the bids by removing the reserve price after the bidding starts. Seller: The seller is responsible for getting the car o the auction site after registering it and receiving a lot number. Auction Staff: They’re responsible for orchestrating the event, which can include creating the order that cars show up on the block, driving bidding excitement and keeping records of who bid on what and for how much. Bidder: As the bidder, you’ll need to know what you’re bidding on. High end auctions will often weed out replica cars being passed off as the real deal, but as is usually the case in classic car sales, it’s up the buyer to be absolutely sure. No auction will be making guarantees about the authenticity of the goods for sale, and once that hammer falls and the bidding closes, the winning bidder is obligated to pay. It’s important to note that the winning bid isn’t the only cost involved with the auction. There are usually auction fees to concern yourself with too. Each auction is different, but you’ll want to account for these fees before you start bidding. It’s common for the winning bidder to pay the auction house 10 percent of the winning bid, above and beyond the actual bid, for services rendered. They seller of the car also gives 10 percent of the actual winning bid as well. Essentially, the auction house makes 20% of the winning bid as a commission, which is a cost shared by the seller and buyer. There’s not just auction fees though. You should keep in mind that once you’ve bought a car at auction, you’re responsible for getting it home. Reputable car transportation is often available on-site, but you might also inquire with other companies about the options for getting your “new” car home. If you’ve traveled a long distance to get there, then you also have transportation costs and housing costs that add to the overall cost of the trip, and therefore to what you’ve invested into the car you’re bidding on. The fun of being a part of the auction might not always justify the added expense when you decide what a certain car is worth to you. In the end, auctions are about more than just getting a classic car at a good price though. They’re meant to be spectacles too, and have been a staple of the collector car community since day one. If you’ve never been to one, you should make it a priority. Even if you don’t plan to bid, you’ll see some incredible cars and incredible people. Auctions are a lot of fun for everyone.